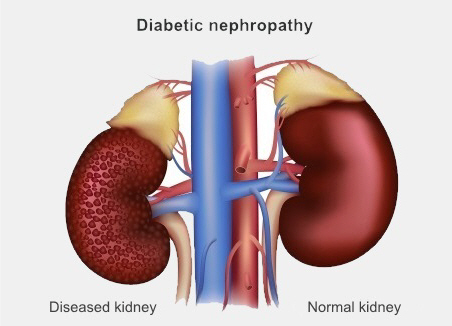 Diabetes is the most common cause of kidney failure, because of diabetic nephropathy. Diabetic nephropathy happens when, over many years, high glucose levels damage your kidney's filtering units. As a result they leak protein into your urine – this is often the first sign of damage. Over time, many of the filtering units stop working, so your kidneys can no longer remove waste. This leads to chronic kidney disease (CKD). Your healthcare team will regularly check your urine for any signs that your kidneys are leaking protein. They will also use blood tests to check how well your kidneys are working. If they notice any early changes, they can take steps to help you prevent further damage. Not all people with diabetes get diabetic nephropathy. Making sure your blood sugar and blood pressure are well controlled helps to reduce your risk of getting diabetic nephropathy, or slows down the disease if you do get it. swollen feet and legs (oedema). renal ultrasound, which measures the size of your kidneys (kidneys can get smaller with diabetic nephropathy). starting medicines to lower your cholesterol levels. If diabetic nephropathy becomes severe, you will need dialysis or a kidney transplant. This factsheet explains how diabetes can cause kidney disease, and what you can do to avoid damaging your kidneys. Written by HealthInfo clinical advisers. Endorsed by clinical director, Nephrology Department, Canterbury DHB. Last reviewed August 2016. Renal Resource Centre – Analgesic nephropathy, retrieved April 2016.